"This year's release is a blend of 18, 12, and 8-month bourbon barrel aged KDS Dark Star in 12-year old Kentucky Bourbon barrels. The roasted and chocolate malts complement the smooth oats to bring you a stout delight wrapped in gentle embrace of Bourbon Barrel aged warmth. A touch of sweetness dances in balance with the hops to finish with a wave and then she’s gone." Pours dark as night with just a hint of dark brown/ruby red on the edges and it produced less than a finger of almond-colored head. Sweet, sticky bourbon up front on the aroma followed by dark chocolate, coffee, char, tobacco, and wood. I get some nutty qualities too and I'm getting a good dose of dark fruits and cherry. There's an overall heat to the aroma from the alcohol, but it doesn't sting the nostrils. Digging even deeper I pick up vailla and caramel. Very complex. ...Where am I? Oh, right, back to business. The complexities of this start to come out as it warms as the milk chocolate, dark chocolate, coffee, and roasted malts keep getting bigger and bigger with each sip. It's crazy, but I get a dessert-like vanilla/creme brulee/marshmallow flavor to this. Maybe it's the vanilla plus the char that's making that happen, but man is it great. The heat from the alcohol is here, but it would be silly not expect something like that from a 14.5% barrel-aged stout. In this case, I'll allow it (thank you, Mills Lane) since the boozy taste adds even more complexity. Mouthfeel is thick and full. It has a great fluffy character (think 3 Musketeers Bar) to the body. As I said, the alcohol brings some heat and warming with each sip, but it's not an issue at all. 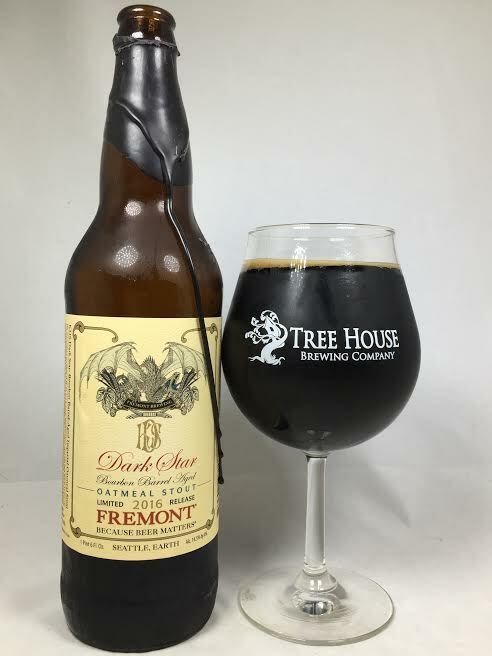 Everything I heard about this beer and Fremont Brewing's barrel program has lived up to the hype. BA Dark Star is a world-class stout. A few years ago this may not have gotten the attention it deserved, but as years go by, more and more people are getting their hands on it and it is getting recognized in the craft beer community. Compared to so many world-renowned BA stouts, this one is up there and surpassing a lot of them. It deserves to be mentioned with the likes of Goose Island Bourbon County, Firestone Walker Parabola, and so many others. Truly among the best of the best. Seven thumbs up!